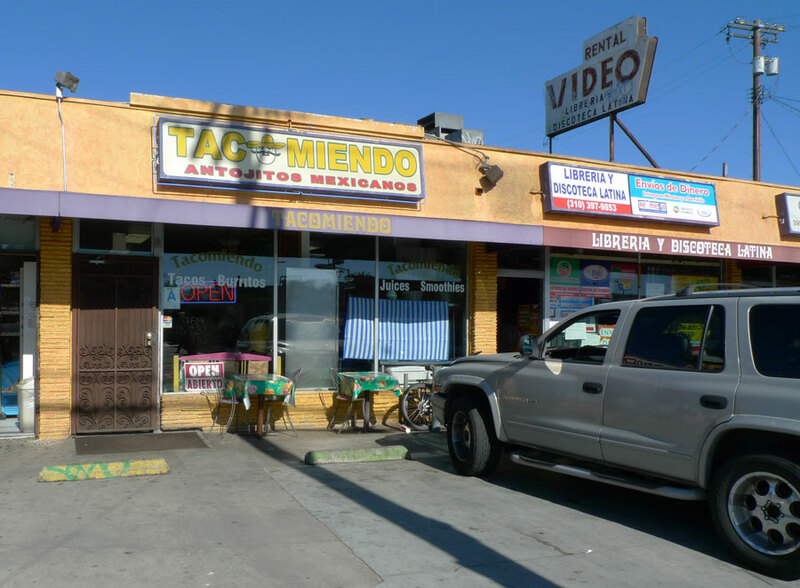 Carmen and I went for lunch at Tacomiendo, a local favorite for Westsiders in a little Culver City strip retail building near Mar Vista. Carmen told me they feature handmade tortillas. In 2009 I didn’t recognize how important a component of the taco the tortilla is, but tortillas are the boss – that might be the first lesson learned from the cincuenta taquerias project. One grasps for an analogy – is the tortilla to the taco what the bassline is to the rock and roll song? Maybe it’s both the drums and the bass. The tortilla is the taco’s rhythm section. Tacomiendo’s tacos are $2.35 each, from which fact I inferred they would be large. I ordered two of them, the carne asada and the carne adobada. They were above average in size, although not huge – in maybe the 80th percentile based on this year’s visits? Shame on me for bringing neither my scale nor my calipers with which I could objectively evaluate these tacos. The tortillas are fantastic. They are 2mm thick and are graciously sized, so that they easily encompass the meat and allow you to eat the taco easily without any meat droppings. The tortillas are browned prior to serving, and the potent flavor of grilled tortilla – imagine if you will what you taste if you throw a flour tortilla onto a hot nonstick plan, brown it, and then eat it – comes through clearly amidst the flavors of the contents. The carne asada here is very good, elegantly minimal with salt and pepper. It’s the straight-up carne asada. Tacomiendo features a full salsa bar, and you the customer are obliged or privileged to add the salsa, cilantro and raw white onion yourself. Tiny diced grilled green onions are mixed in with the meat, adding some savory flavor. I chose the rojo salsa, rather smoky-peppery and mild-to-medium in heat, and with the meat and tortilla, this made for a very satisfying carne asada taco. The carne adobada was good too, although not terribly remarkable – if you eat one piece at a time with a fork, it tastes rather bland, but that center bite of the taco, which is thickest with meat thanks to lessons you learned in Taco Geometry 101, was rich with gamy and fatty flavor. I used the verde salsa on the adobada, which was tart but not as spicy as I would have preferred. Carmen observed that I am happier after eating tacos. I pondered the truth of this – the best things in life are free, except for tacos, which are about $5, and represent one of life’s great modest experiences. 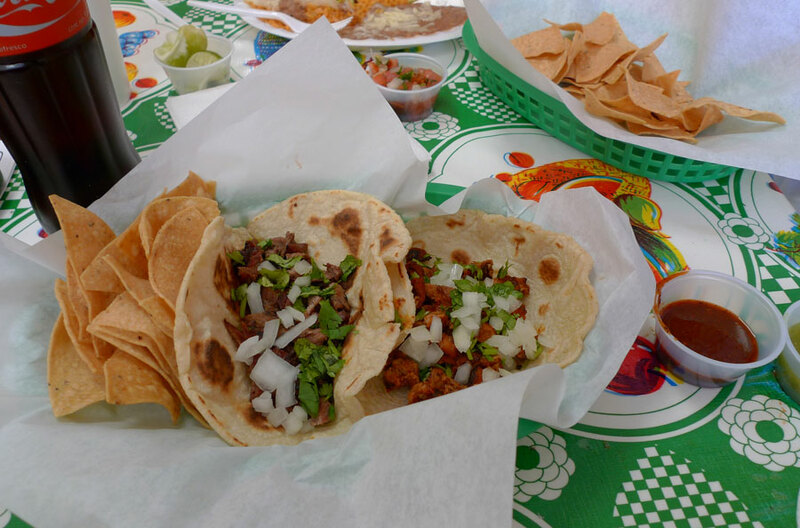 Next time I go to Tacomiendo, I will eat three carne asada tacos, which should keep me very happy for hours if not days. After my visit, I read that Tacomiendo has excellent carnitas. I wish I had ordered one. Don’t make the same mistakes I have made.